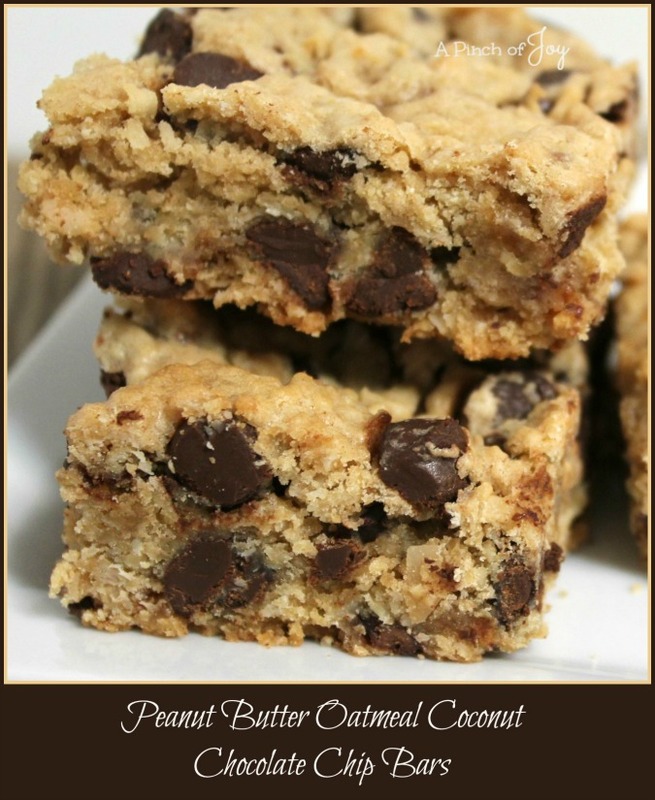 Peanut Butter Oatmeal Coconut Chocolate Chip Bars. With a long name like that, you should know what to expect. All those yum flavors are contained in one little square of not too sweet goodness! What you don’t expect is the chewiness, the subtle texture, the hint of peanut butter. Top that off with the melty chocolate chips —- mmmmm! Line 9x13 inch pan with aluminum foil for easy clean up. Spray with cooking spray. Beat together butter and peanut butter until well mixed. Add sugars and beat well until light and fluffy, about 3 minutes. Add eggs, one at a time, beating until each one is well incorporated. Add flour, baking powder and salt and stir until mixed. 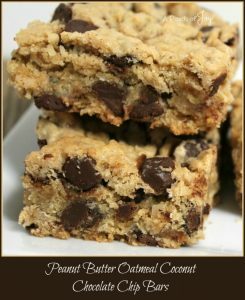 Add oatmeal and coconut and mix well. Pat dough into prepared baking pan. Bake for 25 minutes until golden. Do not overbake. Let cool in pan for 10-15 minutes, then lift from pan to cooling rack, using the aluminum foil for handles.